Offering sales of Simms, Patagonia, and Redington waders in a full range of price and performance - plus sale price waders as available. Video and Reviews of field testing for all of the waders we offer are based on our fishing experience. We inventory a huge range of Gore-Tex and proprietary Patagonia H2-No breathable fabric waders; we also stock waders in a HUGE range of sizes. Kindly give our selection and prices a look, we think you will be pleased. At all price ranges, we have an excellent selection of waders to meet your individual fly fishing needs whether you fish spring, summer, autumn or winter, we have you covered. 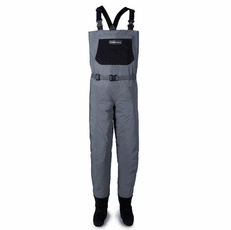 Simms Waders: Simms is a respected manufacturer that focuses exclusively on fishing, and fly fishing waders are one of their many strong product lines. Offered on models for a range of prices, Simms also offers waders specifically tailored for women and youth. 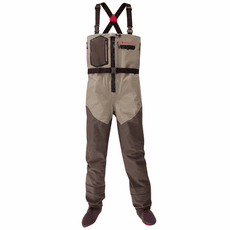 Redington: Redington waders represent an excellent means to achieve the best combination of quality and value price. 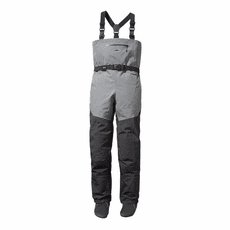 If you are looking for very good waders at great prices, Redington just might be your best choice. We invite you to give the Redington selection a browse. Patagonia Waders: Patagonia is focused on the fishing community; that said, this a highly respected manufacturer has put a ton of emphasis on their innovative ine of waders, and we highly approve of the results. From the H2No technology that is downright waterproof to back-of-leg seams, to suspenders and booties, Patagonia has an absolutely great line of waders and wading boots. The same thinking that has brought together an unexcelled and innovative product line of surfing, skateboarding, and mountaineering gear has not been applied to deliver an outstanding, no-nonsense line of breathable waders to the fly fishing industry. 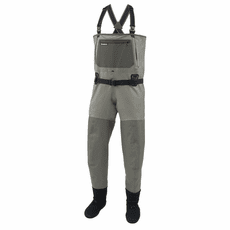 Wader fit: If you know your wader fit, you�re set already. If you are unsure, please give us a call and our staff will gladly help you choose a good wader fit. We stock or have access to ever wader shape on the planet, given that Simms, Patagonia, or Redington has their supplies on hand. If we don�t have it on the shelves in the back room, we can get it for you right fast. Waterproofing Technology: Each wader manufacturer may utilize different materials, number of layers, and vary the number of layers on different parts of the wader depending on price and expected season of use. Gore-Tex and H2NO technologies are the foundation of Simms and Patagonia, respectively. Both are really waterproof and durable so you just can�t go wrong. Durability of waders: Generally, wader durability is directly correlated with price. No wader is puncture proof, so we advise reasonable caution as you scramble around the Briar Patch. Simms, Patagonia, and Redington all manufacture and design waders suited to the demands of modern anglers and people who work around water; they utilize the best technology and materials and are far superior to the waders we wore in days of old. Suspension System: Many, actually, most of the waders offered by Simms, Patagonia, and Redington include integrated suspenders and some include a wader belt also. Gravel Guards: Again, the majority of waders these days are of such high quality and also include integrated gravel guards, so please check out the individual wader model to see if they do or do not. Wader Warranty Service: issues involving manufacturing errors are a no brainer, but are extremely rare. All of the waders we carry come with respectable warranties. All warranties take normal wear into account and note misuse or wader abuse as caveats. We stand by all the waders we sell and are generally to work with our customers to achieve satisfactory warranty service.